Fresh-flower crowns are lovely, but some flowers are so delicate that the crown is barely usable. 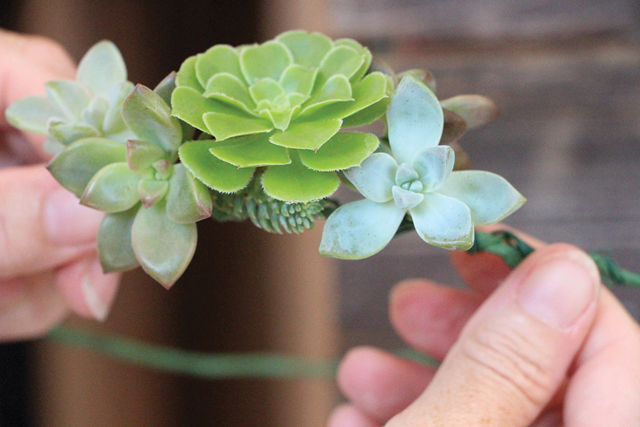 Here’s a stunning and sturdier alternative: a breathtaking succulent crown! Whether it’s your wedding day or you just want to feel like a princess, a succulent crown is sure to make a lasting impression. 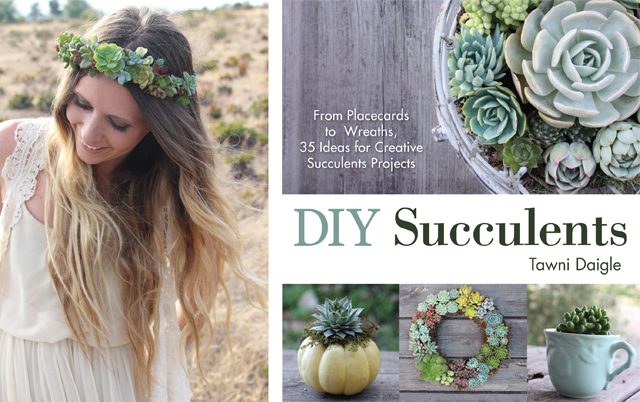 This gorgeous project from Author Tawni Daigle is just one of the beautiful ideas in her new book DIY Succulents: From Placecards to Wreaths, 35+ Ideas for Creative Projects with Succulents. If you love succulents as much as we do, you will appreciate not only her ideas, step by step DIY’s, and tips but her detailed instructions on how to grow and propagate succulents from clippings! Love succulents? Don’t miss our classic How to Make A Succulent Wreath and How To Make A Living Succulent Christmas Tree. Use your thicker floral wire to create a circle that fits around your head where you want your crown to sit. Twist the ends of the wire together to close the circle, and then wrap the circle in floral tape. Cut the stems of your plants short with your scissors. Cut a piece of thin wire about 6″ long. 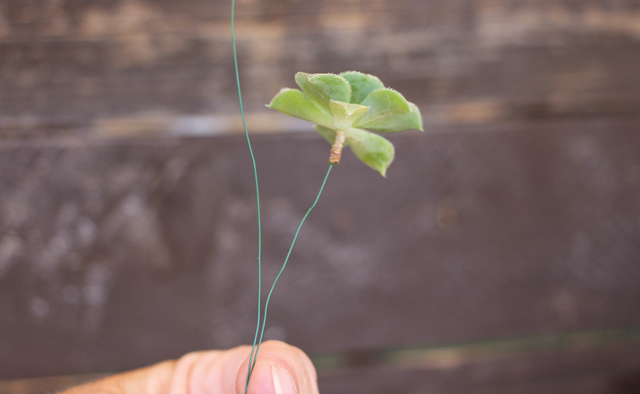 Insert the thin wire into the stem of each plant. 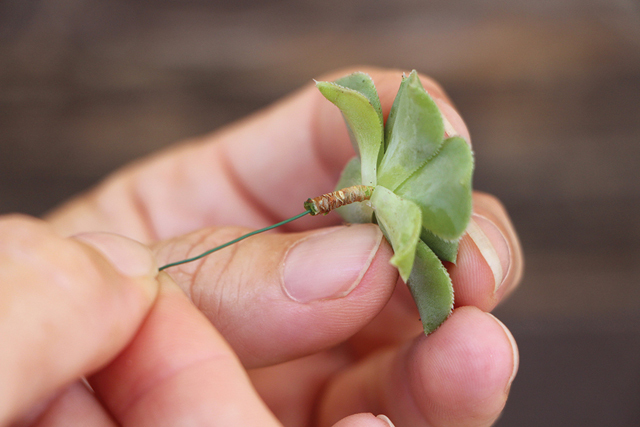 Once you’ve got several succulents stemmed with the thin wire, choose a plant to attach first. Place it on the wire circle where you want it and wrap its wire around the circle. You can use your pliers to squeeze the wires tightly together and to pinch down the ends. Continue choosing plants, placing them on the wire where you like, until your circle is full of beautiful plants. I decided to only do the front half of my crown, but you can do the entire thing if you want. If you have exposed wires, wrap the back half in floral tape once more. 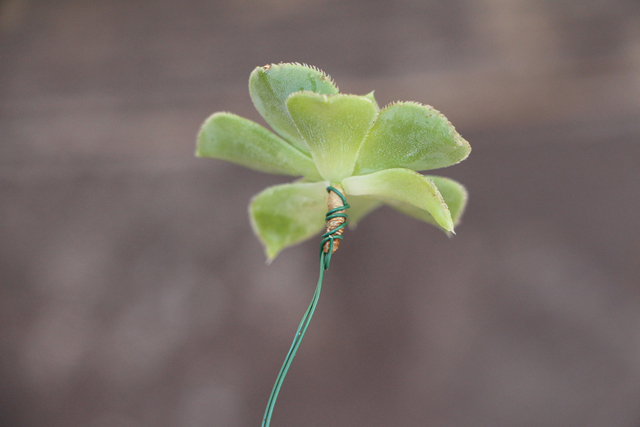 Although the succulents on your crown are still alive, it is not technically a “living” succulent crown in that the plants will eventually die if left attached to the wire. Depending on the type of plants you used, this could take a couple of weeks to a month or so. 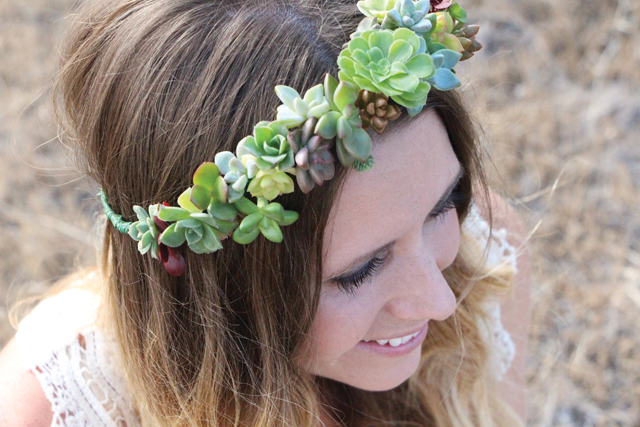 You will definitely get a lot more use out of your succulent crown than you would a fresh-flower crown. If you would like to keep your plants alive, remove them from the wire once they begin to wither, let the stems callus over for a few days, and plant them in well-draining soil. Adding a few succulents in a contrasting shade like purple adds visual interest to the crown. hello! I have a succulent wedding crown that needs to be kept fresh for Tuesday, it’s only Friday. What should I do with it? should I put it in the Fridge?